Your refrigerator is a great convenience for holding your food, snacks, and beverages, but it’s also an energy hog when it comes to paying your electric bill. This problem is especially true for company fridges because their size makes them so inefficient – their cooling operation is often hampered by their own compressor’s heat. No matter the size of your fridge, it’s important to understand how best to utilize the space. One of the biggest drawback with compact fridges is that just opening the door causes enough turbulence to displace all the cold air inside. While that doesn’t effect cold items inside right away, it does mean that each time the fridge is opened, the cold dry air falls out and is replace with warm, humid air. 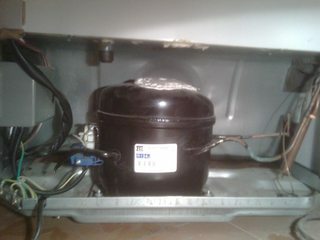 Consequently, the fridge will run to cool the air and remove the moisture. If it can’t remove the moisture, it can cause frost problems. While there are some inexpensive hacks to improve those models with exposed cooling coils in the back, not all fridges are designed that way. Some designs rely on the fridge walls to act as heat sinks to dissipate heat. Of course, this kind of heat-sink design winds up using more energy to keep cool so that they use as much energy as a full-sized refrigerator. So what can you do to keep your food and beverages cool without having to worry? The key to an energy efficient refrigerator – no matter how big or small- is to arrange your food so you can get at it quickly and easily without leaving the door hanging open, letting everything inside start to warm up. If you’re going to eat those apples this week, they don’t need to be in the fridge. Just leave them in a cool, dry place like your pantry! Not everything we think needs refrigerating actually needs to be refrigerated. Bananas actually turn brown faster in refrigerators. Tomatoes, apples, and pears are all happiest at room temperature. In fact, these products release ethylene gas which can cause other fruits and vegetables to over-ripen ahead of schedule. Instead, store them somewhere dry and out of the sun, depending on how fast you plan to eat them (this week, next week, this month, etc.). And with the exception of mayonnaise and other foods containing eggs, most condiments can be stored at room temperature. The vinegar composition of ketchup, mustard, and similar products keeps them free of bacteria and mold, while soy sauce is preserved by its high salt content. Check the ingredients. You’ll probably only use them once, whether because you bought them for a super-specialty recipe or because they didn’t taste good. Reconsider keeping that jar of maraschino cherries, anchovy paste, the meh-spicy salsa, or the jar with one scrawny pimiento. This stuff is just clutter, so ditch it (but make sure you recycle the vessel itself!). As in, keep stuff you use the most frequently at the front of the shelf or in the door compartments. This includes beverages, water bottles, fruit juice, and similar items. While the door isn’t going to be the coldest spot, it’s the most convenient. You want your grab-and-go items here, because, the less you have the fridge door open, the better. Most newer fridges are already designed just for this. It’s a myth that the coldest temperatures in a refrigerator are at the back and bottom. Unfortunately, some compact fridges have their compressor directly under the back and bottom with little or no insulation. So, while the coldest air might pool at the bottom, the surface temperature might actually be the one of the warmest (this will vary between manufacturers and models). An easy and cheap way around this is to cut out a piece of 1/4” thick rigid foam insulation (available at home improvement stores) to fit at the bottom of the fridge. The foam will help reduce the amount of heat radiating from below. Also working in your favor with this hack: the foam is thin so it doesn’t take much room; it’s waterproof so it won’t go all soggy; and it’s washable. Where’s the coldest spot in a compact fridge? To ensure your lunch meat, cheese, or other perishable items remain at the right temperature, keep them close to the center or lower two thirds (depending on shelving) of your fridge. While this might be an impressive haul of food, it’s also causing your refrigerator to work overtime. While you may have heard that keeping your fridge full saves energy, cramming your frost-free fridge as full as possible can reduce air flow – and this can cause ice buildup during defrost cycles. Over time, ice buildup makes it harder for the fridge to maintain temperature properly. Learn where the vents are in your fridge and arrange your items so that these vents are not blocked. Do you have any tips and advice for proper food storage in your refrigerator to ensure it is as energy efficient as possible?? Share with us in the comments!